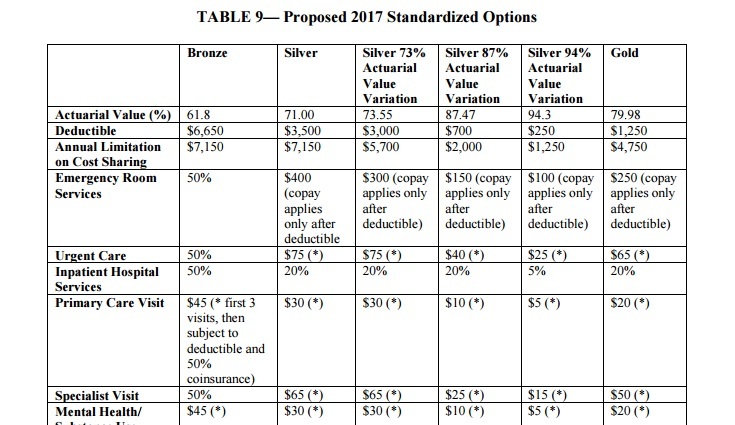 A batch of draft regulations may also create a new family of standardized options plans. The 2017 open enrollment period could run from Nov. 1, 2016, through Jan. 31, 2017. The Centers for Medicare & Medicaid Services focuses more on creating a line of easy-to-compare health insurance products in a major new batch of draft insurance rules, and punishing rogue agents and brokers, then on offering insurers new reasons to put plans on exchange shelves. CMS is preparing to publish the draft regulations in the Federal Register Dec. 2. Comments will be due Dec. 21. The contacts listed include Melissa Jaffe, for risk corridors matters, Lisa Cuozzo, for the rate review process; Jennifer Stolbach, for state-based exchange matters; and Briana Levine, for matters related to agents and brokers. What’s in there for insurers? Executives at UnitedHealth Group Inc. (NYSE:UNH) pointed out Thursday that they are seeing people with health problems acting as “free riders,” and enrolling in exchange coverage, through the special enrollment period (SEP) process, only when they are sick. On page 163 of the PDF, CMS suggests that it might rewrite the SEP rules to let an exchange cancel fraudulent enrollments retroactively. CMS has also proposed making complicated changes to the PPACA “three R’s” risk management program reporting procedures that might have mixed effects on insurers. Some insurers and others have complained about the PPACA individual major medical open enrollment period overlapping with the Medicare plan open enrollment period. Some consumer groups have complained that consumers using HealthCare.gov have a hard time making true apples-to-apples comparisons because of big differences in plan cost-sharing rules. In provisions that apply to the exchanges that use the HHS HealthCare.gov enrollment system, CMS has proposed eliminating the requirement that the vendors responsible for training HealthCare.gov exchange agents verify those agents’ identity. (Pages 144 to 146) The exchange plan issuers already have to verify agents’ identity, so, there is no reason for the training vendors to also have to verify the agents’ identity, CMS says. CMS would also let Web brokers handle the application process on their own systems, and connect with HealthCare.gov only for eligibility verification purposes, rather than forcing Web brokers to channel customers to HealthCare.gov for the application process. But CMS has also included a long section on agent and broker disciplinary rules. (Pages 136 to 144) Officials have focused heavily on concerns about cases of producer fraud and abuse related to use of consumers’ personally identifiable information. Under a proposed regulation, “if HHS reasonably confirms the credibility of an allegation that an agent or broker engaged in fraud or abusive conduct using personally identifiable information of exchange enrollees or applicants, or in connection with an exchange enrollment or application, or is notified by a state or law enforcement authority of the state or law enforcement authority’s finding or determination of fraud or behavior that would constitute abusive conduct in such a circumstance, HHS will notify the agent or broker and terminate, immediately and permanently, the agent’s or broker’s agreements with the [exchange system] for cause,” CMS says. “While states remain the primary oversight authority for agents and brokers, HHS reserves the right to take any other permissible enforcement or remedial action against an agent or broker for violation of federal requirements,” CMS says. An agent or broker could appeal a termination action, CMS says. CMS has not proposed a similar set of provisions for navigators or other types of non-agent, non-broker exchange helpers.